We like to make a concious effort to eat less meat and more vegetable, but we do love a burger. 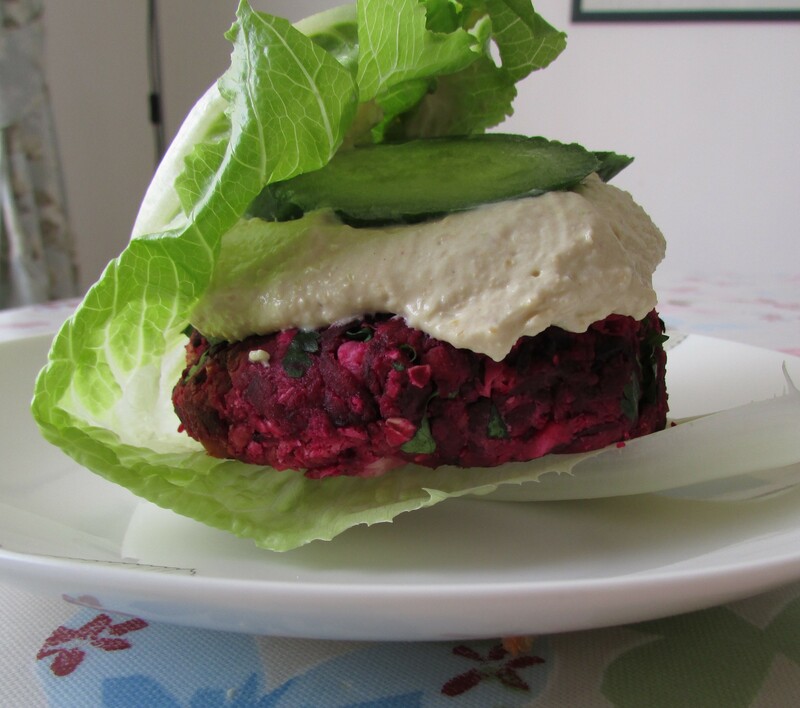 So I thought I’d create a healthy meat-free burger that we could all enjoy. This week in the veggie box I got a bunch of beetroot. Beetroot comes into season around this time and you can pick your own at Medley Manor Farm. Usually I’d make beetroot into chocolate fairy cakes (see recipe here), but I thought for a change I’d make a dinner savoury delight. Beetroot’s are packed full of vitamins, minerals and protective antioxidants demonstrated by their beautiful colour. This recipe is super easy and can be whipped up in less than 5 minutes. Instead of a bun you can also use lettuce leaves, or get the mini buns for when you’re entertaining others children. Here’s the recipe; Take a 150g tin of chickpeas, drain and mash them (or soak and cook your own – it’s much cheaper!). Add 200g of grated beetroot, 100g of flour (any flour works – for gluten free try rice or chickpea flour), 100g of crumbled feta, two eggs, 1 tbsp of horseradish sauce and handful of chopped coriander. Combine all the ingredients thoroughly in a bowl and then portion them into 4 burgers (or 8 little burgers for kids) with your hands. Grill the burgers for 5 minutes on each side and serve with a dollop of hummus or mayonnaise and some salad. Healthy and delicious! This entry was posted in Frugal Family Meals, Low cost Lunches on July 17, 2015 by carolinementzer.